I haven’t met Mike—or Micheal, as he spells it for reasons he’s reluctant to confess—but our mutual friend Lou Anders sent me his latest novel, Sword of the Bright Lady. After the first chapter, I saw why Lou had thought of me: Mike, who usually writes science-fiction, tackles fantasy from the perspective of both a scientist and, well, a rules lawyer. Instead of disguising the rules mechanics of roleplaying games, Mike embraces them. It’s not that you can “hear the dice rolling” as actions occur but that he doesn’t flinch from extrapolating on how the mechanics in a game would work in a fantasy world. 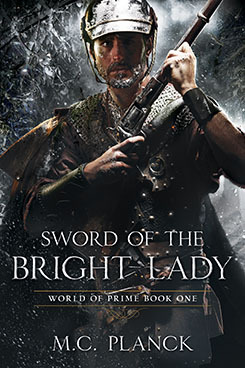 There’s much more, but rather than spoil it, I’ll suggest you check out Sword of the Bright Lady, available now, and read what Mike has to say about it here. 1. Most writers would pick a warrior, rogue, or wizard as their protagonist, but you went with the cleric. The cleric! What made you pick that sort of character? Of all the classes in D&D, clerics are the only ones who have any social connection or any reason to care about society. Fighters are supposed to be nobles, but their skill set (and the way they are played) really makes them just knights-errant, i.e. wandering adventurers distinguishable from murder-hobos only by the quality of their clothes. Wizards are classically loners, and rogues exist to despoil society. But to me, social connection is where true power lies. The pen is mightier than the sword, and no, this doesn’t mean bards, because nobody takes singing swordsmen seriously. So I always played clerics in D&D. Of course D&D doesn’t actually work like that. 0-level people are essentially scenery; they exist to be saved from monsters and nothing else. Heroes typically have the skills or magic to make their own weapons, armor, food, and everything else: ask a D&D character to get fancy clothes, and their first stop is likely to be a genie. This annoyed me greatly when I started playing, and as a consequence I always played clerics, and they always spent all of their time trying to bend the rules to make ordinary people matter, much to the despair of my various DMs. I recall spending one entire campaign trying to build tanks out of animated dinosaurs and ballistae, so that ordinary soldiers could face down monsters by themselves. This book, then, is my final revenge on all of my DMs, where I get to just flat-out rewrite the rules to achieve my nefarious ends. 2. Like Larry Niven and to some extent also the late Joel Rosenberg, you take a science-fictional approach to your fantasy world. What questions does SF make you demand of a world of magic? And how do you answer them? I have an idiosyncratic definition of the difference between SF&F: to me, science fiction is about real people in an unreal world, and fantasy is about unreal people in a real world. In science fiction, you change one (or more) aspects of the world’s natural laws, such as the speed of light, time travel, or the laws of information and thermodynamics. Then you see how people’s lives would be affected. For me, story is about character more than plot, so how events affect people’s character is keenly important. In fantasy, people typically write about archetypes: the rogue, the wizard, and of course the hero. The plot is the Hero’s Journey, and the world building—while often detailed and beautiful—does not actually have to make sense. The concept of a ghost illustrates this perfectly as soon as you ask: why does a ghost wear clothes? The answer is because a ghost is defined as a person without a body. Thus, the reader automatically knows that anything not explicitly ruled out defaults to a normal person. Ghosts walk across the floor without sinking in to it, and no one thinks twice. This is not a change in the rules of physics; it is a change in the definition of an archetype (in this case the archetype of a person). The writer explicitly says, “This character is a person with magic.” There is no need (in fantasy) to explain where that magic comes from, or why other people don’t have it, just as there is no need to explain the ghost’s clothes. The magic is a change in the definition of a character, not in the definition of a world. So for my science-fiction masquerading as fantasy (as one reviewer has already noted), I have to answer a lot more about magic than the typical fantasy novel. I have to explain how magic affects the global economy. This is often about as exciting as explaining how the carried-interest rule affects the global economy, which is why so few authors do it. Regrettably I do have at least one discussion about interest-bearing bonds, but hopefully the concurrent explosions will keep the reader entertained. 3. As a GURPS gamemaster, you’re infamous among your players for being exceedingly well prepared with world design. What does your story bible for Sword of the Bright Lady look like? How much effort would it take to turn it into a game sourcebook? It looks a lot like this: World of Prime. Although I am in the process of revising it to match the changes I made while writing the sequels. The essential component that makes it stand out from any other world is the idea that XP is tangible. In every version of D&D gold and XP were interchangeable; in 1st you got XP for every gold piece you stole, in 3.5 you could pay 5 gp for every XP in a magic item. I am a big fan of symmetry and simplification in rules systems. So I thought, what if you just took that literally? What if gold and XP really were the same thing? Much to my surprise it produced a world that was fun to game in and made more sense. The players loved having control over the most vital resource in the game: they made decisions about when to gain levels and who should get them. I knew I was on to something when my players voluntarily spent more XP on their henchmen than any rule would have required them to. And finally I had a reason why the guy in the castle is a badass, and why he cares about the peasants in the fields. Those people–those thousands of CR ½ encounters–represent the source of his rank. Monsters eat people not for food (what a ridiculous ecology) but for the XP they generate, because monsters, being magical creatures, need XP more than anyone else. The souls of sapient creatures is what drives the supernatural economy. This gives the DM a mechanic other than pure fiat, it gives the players cues to how the world works (and how to work the world), and it fits our intuitive sense that people matter and kings should be fearsome. 4. Your hero enjoys certain advantages once he discovers he’s in a different world. Kendo is one of them, but his knowledge of engineering is even more important. How much of a background do you have in both Kendo and engineering? I am a software engineer and I studied karate. So, the less useful versions of both. But essentially my hero doesn’t do anything I don’t know how to do, other than make ball bearings. I had to look that up on the internet, and I still don’t understand how it works. Although it’s not as easy as I make it look. In an attempt to validate my “backyard chemistry,” I made black powder literally in my backyard. I did this under the supervision of my father-in-law, a doctor of Chemical Engineering and himself an old hand at it (he used to mix it up when he was a boy at the end of WWII), and starting with modern refined chemicals. What I produced was a substance that was inflammable in the logical sense: when dumped upon a lit match, it extinguished the match. 5. After finishing the novel, I took you for an outliner. (Correct me if I’m wrong.) How tightly do you outline? 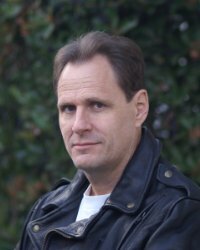 Do you have a vague idea of the main events of the next four novels? or do you have something a bit more granular already worked out? When you say outlining, I think of the way my wife (Sara Creasy, Song of Scarabaeus) works. She writes the whole story in a few pages, and then goes back and fill out each sentence with a scene. I don’t do that (and I don’t understand people who do—it looks too much like work!) Instead, I write fractally: I know the beginning and the end, and then I just fill in the middle. Theoretically I could write any arbitrary amount of words in-between the endpoints, at ever increasing levels of detail. However, I try to adhere to the rule of only actually writing the interesting bits. The original draft of the manuscript had a scene where Christopher bought finger-nail clippers, because I was panicking about living in a medieval world without modern conveniences and I wanted to justify how he solved that particular problem. Fortunately for the reading public, my wife (who is also my first line-editor and a writer in her own regard) objected to the amount of shopping my main character did. Not to sound sexist, but when a woman says your main character is spending too much time shopping, your main character is spending too much time shopping. For this series, I wrote the closing pages just after the writing the opening chapter. Since then I’ve been figuring out how to get from here to there. I do have a fairly hefty amount of notes on the remaining books but mostly they are specific scenes that I know I want to include. I don’t write with a theme in mind, but I do tend to have an emotion I want to explore. I find that creates themes, and as I’ve written this series I have discovered that each book (I have finished the first 3 so far) has its own mini-theme. Because of that I now know what the mini-themes of the next two books have to be. To be fair, it doesn’t always work this way—I am working on an SF novel and halfway through I realized that I had the ending totally wrong. I mean totally—the faction I thought would win the conflict turns out to lose it. But, you know, I don’t actually make up these stories. I just interview the characters, and they tell me what happened. Pick up Sword of the Bright Lady at your local bookstore or from the inevitable online retailer.